Racer games can be played with the greatest nonchalance and the utmost skill and expertise. Whether you are interested in racing in general or you are looking for a game to test your racing skills with an exciting and intense gameplay, there are a few games that offer you this. In order to help you choose the best one of them all, we decided to search and we discovered one thrilling racing game for all android users and race lovers. Let’s see what the game offers you. This racing game is easy to play and suitable for all virtual racers that like to challenge their racing skills and enjoy the entertaining and exciting gameplay. 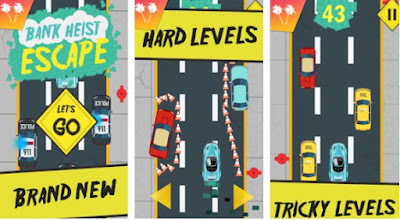 With this racer game, players will have the chance to get into the interesting background story of the game and enjoy the amazing high-quality graphics with cool car to race in, full of cash from the robbed bank. The easy on screen controls will help the player easily race and avoid other cars, cops and the FBI to make his grand escape through the city. Players with the fastest skills for racing will get the highest scores and become the ultimate racers of the game. The Bank Heist Escape has to offer features that will keep the attention of the player, making him addicted to the game on his first try. The players need to save themselves and get away from the cops and FBI with their car full of cash by racing through the city full of traffic. While the players are racing and escaping the cops they need to be careful not to hit other cars. The players that get caught by the police or hit another car will lose the game. By racing as fast as they can and using the on screen controls for moving the racing car left or right the players will get to progress in the game and win high scores. This game has offerS multiple tricky levels that are letting the player have fun and experience a real racing feeling every time he plays. 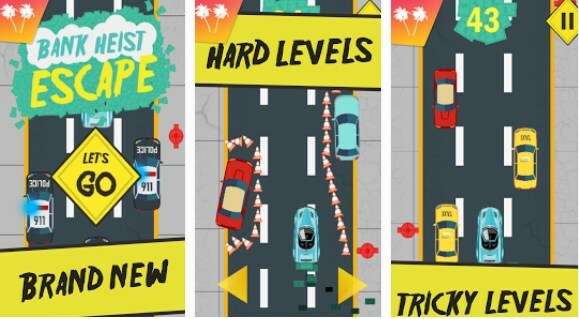 Each player will test his skills of racing and get the chance to become the best racer by avoiding the cops in each level and racing as fast as he can, getting the highest scores possible. Download this game on Google Play for free and get away from the cops full of cash!